با توجه به فراوانی نیترات در آب و مشکلات ناشی از آن، حذف آن از جمله اهداف مهم در پالایش آب است. به‌منظور بررسی اثر اسید هیومیک بر کارایی پالایش نیترات توسط نانوذرات آهن صفر، آزمایشی به‌صورت فاکتوریل در قالب طرح کاملاً تصادفی در سه تکرار انجام شد. 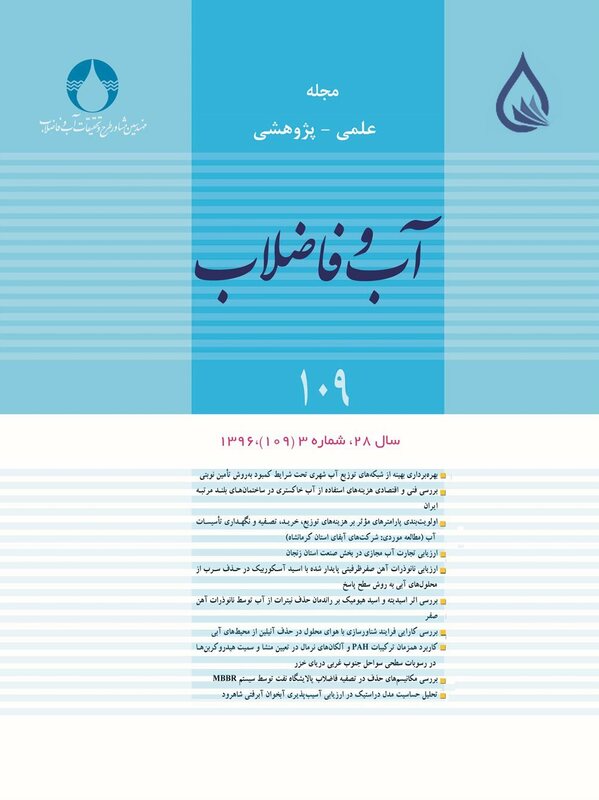 در این مطالعه نانوذرات آهن صفر ظرفیتی به‌روش هم‏رسوبی سنتز و برای بهبود پایداری در محیط آبی بر روی ذرات شن تثبیت شدند. غلظت‏های مختلف اسید هیومیک شامل 0، 25/0 ، 75/0 میلی‏گرم در لیتر و غلظت نانوذرات آهن صفر ظرفیتی شامل 1، 5/1 و 2 میلی‏گرم در لیتر بود و سپس تغییرات محتوی نیترات در محلول مورد ارزیابی قرار گرفت. نتایج نشان داد که نانوذرات آهن صفر ظرفیتی قادراند نیترات محلول در آب را احیا کنند و در نتیجه موجب حذف آن از محلول ‏شوند. حضور اسید هیومیک راندمان حذف نیترات توسط نانوذرات آهن صفر را کاهش می‏دهد. بیشترین حذف نیترات حدود 58 درصد در pH برابر 4 و غلظت نانوذرات آهن صفر ظرفیتی برابر 1 میلی‏گرم در لیتر و کمترین میزان حذف نیترات حدود 7/3 درصد در pH برابر 5 و غلظت نانوذرات آهن 2 میلی‏گرم در لیتر مشاهده شد. نتایج این آزمایش نشان داد که اسید هیومیک عامل مهمی در احیای نیترات بوده و این تأثیر در غلظت‏های پایین‏تر اسید هیومیک بیشتر است. بیشترین راندمان احیای نیترات توسط نانوذرات آهن صفر، در عدم حضور اسید هیومیک در pH برابر 4 معادل 44 درصد بود. همچنین مناسب‏ترین مقدار pH برای حذف نیترات برابر 4 و راندمان حذف در این pH به‌طور میانگین 34 درصد مشاهده شد. Nitrate is a wide spread pollutant whose removal from aquesous solutions is a major goal of water treatment processes. The present experiment was conducted using a randomized complete block split design with three replications to investigate the effects of humic acid on the nitrate removal efficiency of nanoscale zero-valent iron particles. For this purpose, nanoscale zero-valent iron particles were synthesized using the co-precipitation method and stabilized on sand fractions to achieve better stability in the water environment. Different concentrations of humic acid (0, 0.25, and 0.75 mg/l) and nanoscale zero-valent iron particles (1, 1.5, and 2 mg/l) were used as the variables to evaluate the resulting changes in the water nitrate content. Results showed that nanoscale zero-valent iron particles were able to reduce nitrate ions and, thereby, remove it from the solution. Humic acid was found to reduce the nitrate removal efficiency of nanoscale zero-valent iron particles. The highest nitrate removal (58%) occurred at pH 4 with a nanoscale zero-valent iron concentration of 1 mg/l while the lowest was observed at pH 3.7% with a nanoscale zero-valent iron concentration of 2 mg/l. Humic acid, especially at its lower concentrations, also proved to be an important factor involved in reducing nitrate. In the absence of humic acid, the highest nitrate reduction efficiency of 44% was observed at pH 4. Finally, a pH value of 4 was found to be the optimum level for nitrate removal, which led to an average removal efficiency of 34%. Chen, S.S., Hsu, H.D. & Li, C.W., 2004, "A new method to produce nqnoscale iron for nitrate removal", Journal of Nanoparticle Research, 6, 639-647. Choe, S., Chang, Y.Y., Hwang, K.Y. & Khim, J., 2000, "Kinetics of reductive denitrification by nanoscale zero-valent iron", Chemosphere, 41, 1307-1311. Choe, S., Liljestrandb, H. M. & Khima, J., 2004, "Nitrate reduction by zero-valent iron under different pH regimes", Applied Geochemistry,19, 335-342. Dou, X.M., Li, R., Zhao B. & Liang, W.Y., 2010, "Arsenate removal from water by zero-valent iron/activated carbon galvanic couples", Journal of Hazardous Materials, 182(1-3), 108-114. Dries, J., Batiaaens, L., Springael, D., Kuypers, S., Spiros, N. & Agathos, Diels, L., 2005, "Effect of humic acids on heavy metal removal by zero-valent iron in batch and continuous flow column systems", Water Research, 39, 3531-3540. Fenglian, F., Dionysios, D. & Hong, L., 2014, "The use of zero-valent iron for groundwater remediation and wastewater: A review", Journal of Hazardous Materials, 267, 194-205. Fewtrell, L., 2004, "Drinking-water nitrate, methemoglobinemia, and global burden of disease", Discussion, Environmental Health Perspective, 112, 1371-1374. Huang, Y.H., Zhang, T.C., Shea, P.J. & Comfort, S.D., 2003, "Effects of oxide coating and selected cations on nitrate reduction by iron metal", Journal of Environmental Quality, 32(4), 1306-1315. Jiang, Z. L., Lv, L., Zhang, W., Qiong, D.U., Pan, B. C., Yang, L. & Zhang, Q. X., 2011, "Nitrate reduction using nanosized zero-valent iron supported by polystyrene resins: Role of surface functional groups", Water Researh, 23(8), 1-8. Knobeloch, L., Salna, B., Hogan A., Postle, J. & Anderson H., 2000, “Blue babies and nitrate-contaminated well water", Environmental Health Perspectives, 108, 675-678. Maccarthy, P., 2001, "The principles of humic substances", Soil Science, 166, 738-751. Mak, M.S.H., Lo, I. & Liu, T.Z., 2011a, "Synergistic effect of coupling zero-valentironwith iron oxide-coatedsand in columns for chromate and arsenate removal from groundwater: Influences of humic acid and the reactive media configuration", Water Research, 45(19), 6575-6584. Mak, M.S.H., Rao, P.H. & Lo, I., 2011b, "Zero-valent iron and iron oxide-coated sand as a combination for removal of co-present chromate and arsenate from groundwater with humic acid", Environmental Pollut., 159(2), 377-382. Mueller, N.C., Nicole, C. & Nowack, B., 2010, "Nanoparticles for remediation: Solving big problems with little particles", Mineralogical Society of America, 6(6), 395-400. Neuman, E. & Schmidt, P., 1997, "Agricultural nitrogen in groundwater pollution primer", Journal of Nanotechnology Reserarh, 5, 181-189. Ruangchainikom, C., Liao, C.H., Anotai, J. & Lee, M.T., 2006, "Effects of water characteristics on nitrate reduction by the Fe0/CO2 process", Chemosphere, 63, 335-343. Sebahattin, A. & Necdet, C., 2005, "Effects of different levels and application times of humic acid on root and leaf yield and yield components of forage Turnip (Brassica rapa L.)", Agronomy Journal, 4, 130-133. Shams, S., 2010, "Thesis assessing innovative technologies for nitrate removal from drinking water", Waterloo, Ontario, Canada. Sun, Y.P., Li, X.Q., Zhang, W.X. & Wang, H.P., 2006, "Characterization of zero-valent iron nanoparticles", Advances. In. Colloid. and. Interface. Sci., 120, 47-56. Wang, Q., Cissoko, N., Zhou, M. & Xinhua, Xu., 2011, "Effects and mechanism of humic acid on chromium (VI) removal by zero-valnt iron (Fe0) nanoparticles", Physics and Chemistry of the Earth, 36, 442-446. Wang, Q., Cissoko, N.M., Zhou, M. & Xu, X.H., 2011,"Effects and mechanism of humic acid on chromium (VI) removal by zero-valent iron (Fe0) nanoparticles", Phys. Chem. Earth, 36, 442-446. Xiong, Z., Zhao, D. & Pan, G., 2008, "Rapid and controlled transformation of nitrate in water and brine by stabilized iron nanoparticles", Journal Nanopart. Res., 11, 807-819. Yang, G.C.C. & Lee, H., 2005, "Chemical redution of nitrate by nanosized iron: Kinetics and pathways", Water Research, 39, 884-894. Yang, H.H. & Tian, C.Z., 2004, "Effects of low pH on nitrate reduction by iron powder", Water Research, 38, 2631-2642.